Kick off your reception with a personal touch by allowing guests to indulge in a signature cocktail. These planned drinks often match the colors or wedding theme and make easy an conversation starter for guests– even those that aren’t huge drinkers. Rock candy cocktails are a whimsical treat that bring back childhood memories in a classy way. These cocktails are the perfect edition to your wedding because they are just so simple. 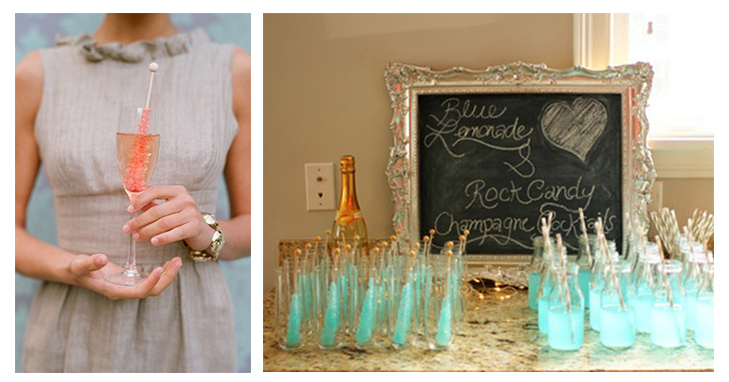 You can pick your favorite champagne and easily add a rock candy stirrer in any color to compliment your decor. Guests will appreciate the matching details and you’ll automatically have a drink menu that wows. They also can serves as a decorative touch– just line empty glass that haven’t been used yet and garnish them with the rock candy sticks. Get inspired (and thirsty) by some of these yummy rock candy creations! Chill the glass, mix ingredients, shake well, and pour into martini glass. Add the rock candy stick for an adorable accent. Combine vodka and triple sec in a cocktail shaker filled with ice. Shake well. Strain mixture into chilled glasses, and garnish with the candy. Serve immediately and enjoy with your guests!